Comfort and features packed into a watercraft built to let you ride as long as the day will allow. The Ergolock seat with stepped design delivers confidence, comfort and a smooth ride on any type of water. Stylish luxury never came this easily. The narrow seat places your knees closer together in a natural riding position, while the stepped seat design provides more lateral support and stability for you and your passengers. This model comes standard with 42.8 US gal. (162 l) of total storage space with a watertight compartment, a tilt steering and a cruise control with slow mode. Choose how you want your power delivered thanks to different riding modes such as Touring, Sport and ECO - available through your watercraft digital information center. 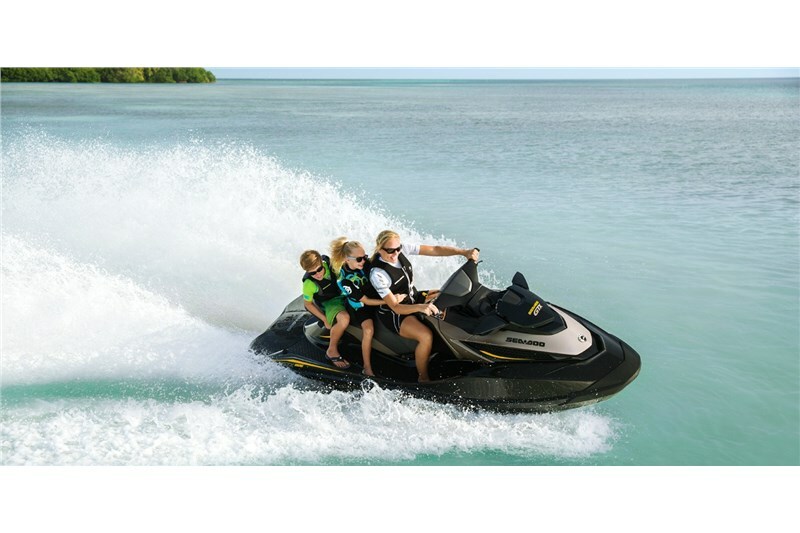 Design features a Digitally Encoded Security System unique to your watercraft that serves as an effective theft deterrent. Learning Key also limits speed for beginners. The most powerful, naturally aspirated Rotax engine on a Sea-Doo offers instant acceleration for instant fun. Tested and proven to be incredibly reliable and fuel-efficient for more than a decade. Operating electronically, this advanced throttle system starts you in neutral for easier dockside starts. It also features activity-specific Touring, Sport and ECO modes that can all be set to accommodate your riding style. The result is a more responsive, more intuitive ride. The programmable Learning Key allows you to limit the performance of the PWC based on rider skill-level. Uses coolant to keep the engine running at the ideal temperature, much like a car’s radiator. Also keeps out corrosive saltwater and debris. The “Brain” that integrates and controls all systems to create the best possible ride. Stepped, stable & strong. The stepped design reduces drag and keeps you glued to the water. Offers a choice between two throttle responses for different riding styles. Touring mode is the default setting offering a more progressive acceleration curve for a more confident ride – ideal for cruising and 2-up riding. Sport mode can be easily activated using the Sport button. It provides all acceleration performance for a more aggressive throttle response. Seat with narrow profile and knee support that lets people sit in a more natural position and leverage their leg muscles to hold on to the machine for more control and less upper body fatigue. Also featuring a stepped design for more comfort and better visibility to passengers. The VTS adjusts the angle of the nozzle to change the behavior of the watercraft and improve parallelism to the water. 4 adjustable steering angles for maximum ease and comfort. With radio frequency technology and a ball-and-socket design, the Digitally Encoded Security System (D.E.S.S.) key provides riders with easy and quick starts every time. Cruise control, Slow mode, VTS, Fuel consumption instant & average, Fuel level, Tachometer, Speedometer, Hour meter, Compass, Clock, Touring mode, Sport mode, ECO mode, F-N-R indicator and more. First and only true brake on a watercraft recognized by the U.S. Coast Guard for improving boating safety since 2009. Now in its 2nd generation, the intuitive and improved iBR allows you to stop close to 160 feet sooner¹ for greater peace of mind. All with the squeeze of a lever. And with its electronic reverse, it gives you a level of maneuverability that makes docking easier. ¹ Based on BRP internal testing. Delivers improved acceleration, higher top speed and less cavitation.